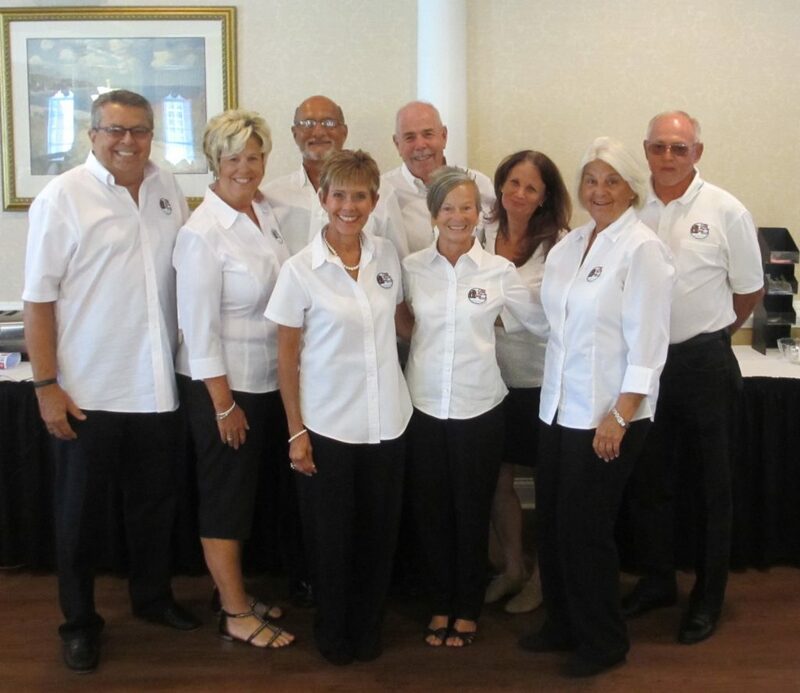 The ODSC Dance Team was asked to dance for the residents at The Lakes at Litchfield in Pawleys Island for a return performance Tuesday May 24, 2016 at 2PM. This year the residents who saw us last year must have spread the word that we were coming back, because the staff made arrangements for us to dance in a larger room so everyone could enjoy the performance. This year we were able to dance for a full hour without anyone falling asleep. Each couple on the team danced at least two songs. At the request of one of the residents, we were asked to dance and then switch partners. She was our choreographer for the afternoon. She said that if she were able, she would join the dance team. She danced while sitting in her wheelchair. A 94-year old male resident rolled over in his wheelchair to Lou Martino and asked Lou if he was a descendent of Gandhi. Of course, Lou said that he was asked that question a lot. We had the opportunity to instruct the staff in the basic step of Shag. They were very energetic. Thanks to the staff for participating and thank you Mackenzie Stroupe, Activity Director for arranging the ODSC Dance Team to be able to dance at The Lakes. Nothing goes better than to dance and then be served banana pudding. The dance team was served banana pudding -yummy. One team member offered a resident some banana pudding; The resident kindly refused stating they he had been living at The Lakes for several years. I would like to thank the members of the dance team for taking time out of their busy schedules for dancing in the afternoon at The Lakes. It was a long day but we enjoyed performing for the residents and for us, we like to dance and enjoyed the fellowship with our team members. There are two people in the ODSC that are responsible for all our Logo merchandise and our 50/50 raffles……and they are Cathy and Connie. I want to tell you a little about both of them. Most importantly, they were gracious enough to take the job of Ways and Means Chairpersons and they are doing a fantastic job! Cathy is married to her darling husband, Rich Jamiolkowski. 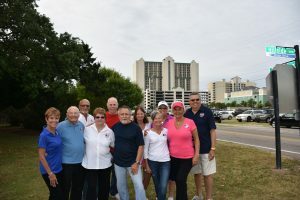 They are from Pennsylvania and vacationed here in NMB for years. Once they retired, they started being snowbirds. Then they realized that this is paradise and moved to NMB in August, 2015. Cathy has been a member of the ODSC for two years. Her favorite Shag Club event is Myrtle Manor. She believes it is really rewarding to spend time with the residents and the residents really appreciate all the shag entertainment. The second member of the team is Connie Livingston. Connie and her husband, Jim, are originally from Ohio have been snowbirds for about 5 years. In 2015, they decided to make NMB their home. Jim has recently been a contractor for the new house they are building and once upon a time, Connie was an Aquatics Director for a health club in Ohio. Connie has been a member for two years and she loves all the parades. Be sure and ask Connie and Jim about their very talented terrier. She does a lot of tricks and is one of the riders in all our parades! 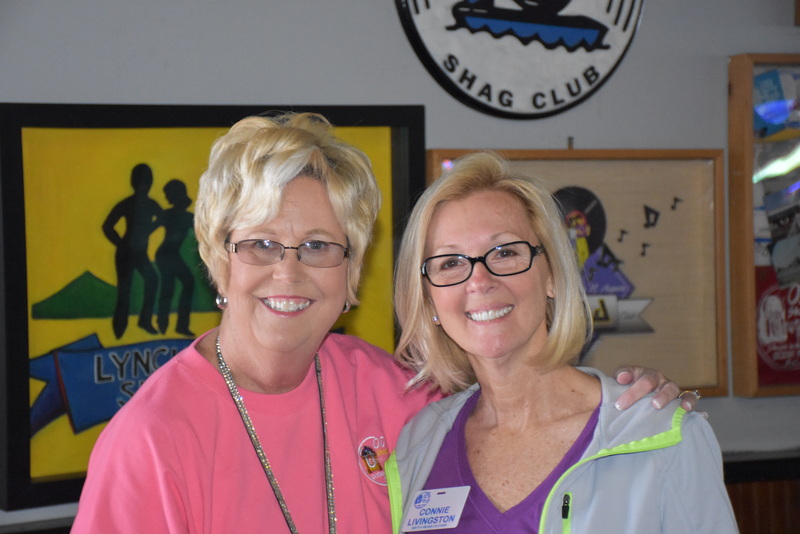 Please take a moment to let Connie and Cathy know how much we appreciate all the work they do for the shag club! They have been troopers and have done a great job! As everyone was pulling up to Saville’s this past Saturday the 21st for the Annual ODSC Cook Out, it was evident someone had been very busy. That someone was Donnie Shultz and his “crew”: Wendy Shultz, Kevin & Susan Harrell, Jim & Wanda Queen. Smoke was billowing up in the sky, and the smell of burgers and hot dogs on the BIG cooker (thank you Jim Queen) was teasing our taste buds awaiting the call of the color food ticket we were holding in our hand. Once inside the members had staged out the tables with sides dishes of potato and macaroni salads, deviled eggs, and much more. On another table were some wonderful tasty desserts of cakes, pies and cookies. The corn hole boards were all set up outside as many were entering their names into the hat to be paired up with a partner who would help them play to a victory. That victory to 1st place was earned by Joe Ferlauto and Clark Chowning. Congratulations!! But I know everyone who played had a great time, (Including myself and my partner Dianne Bauer). For those not wanting to play corn hole, Kitty Earles was spinning the tunes for dancing and Kathy McCoy also taught those who wanted to learn the “Fireball” line dance. There was definitely something for everyone. There was a rumor that we had 160 in attendance. Music continued to be played by Kitty Earles and members were invited to stay and dance or mingle and enjoy the remainder of the evening with owner Stacy Saville whose hospitality was gracious and very welcoming. On Saturday, April 30th, the ODSC had their annual post-SOS Clean Sweep. It was a beautiful day and 28 volunteers participated in during a little sprucing up after SOS. Main Street to BiLo, Ocean Blvd. 5th Avenue North to 5th Avenue South and the Beach. A big thank you to Bill and Joan Bacon and Tim and Paula Webb for having everything ready to go! Coffee, juice, biscuits and wonderful doughnuts were available along with all the clean up supplies. Again I want to give everyone a big THANKS!! For the first time, the ODSC participated in a Bar Crawl during SOS. The bar crawl was a big success. Thanks to the members that showed up. We had a large group and it was noticed by the bar owners and the bartenders when we entered and when we left. We had a great social time and danced at every bar where we stopped. 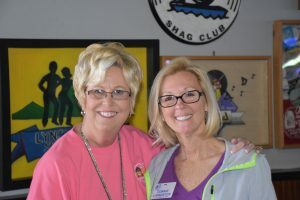 During the ACSC meeting, Robin Morley thanked the ODSC for making all the other shag club members welcomed to SOS as we are the home club during these events. Let’s try to make it bigger and better during the fall and really be the “home team” for the other shag clubs. It was a beautiful Sunday May morning at a temperature of around 70 degrees. The OD Shag Club Dance Team was invited to dance for the Divas Marathon in NMB. This is one of the many events that the Dance Team can dance for the public and promote the Shag Dance to those who do not know what the Shag Dance really is. We always have a great time at this event. We get to dance to the crowd and the runners as well as being able to interact with the runners. The runners range from young to old, tall to short, slow to fast, runners and walkers, men and women, boys and girls, riders and amputees, proud Americans, those who fought for our country, those who are in great shape and those who required assistance, and different nationalities all running for the same cause. One runner came all the way from California to run in this race. Yes we danced in the street encouraging the runners to do their best. If you look close you will be able to see members of the OD Shag Club as runners. Also look for Howie Thompson the author of the book “Fat Harold The Legendary King of Shag. Thanks to Jim and Donna for providing the music. And of course thanks to the OD Shag Club Dance Team members who came out at 7 AM to dance in this event. We danced from 7AM to 9AM. Linda Campbell, John Dryden, Joe Ferlauto, Lenny Gardner, Barbara Hooper, Cathy and Rich Jamiolkowski, Susan Male, Lou Martino, Cherie Patalik, and Diane Tindall.